Just dug out this old badge from when I was a child. 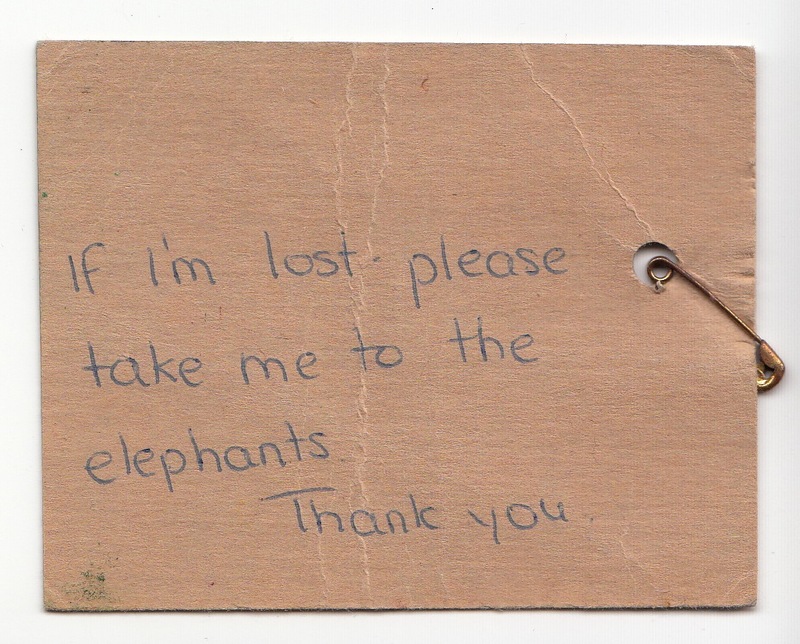 It was attached to me when we went on a school trip to the zoo. 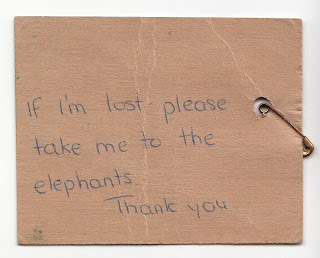 I remember seeing the elephants, but I am not sure if it is because I was delivered there like a lost parcel! 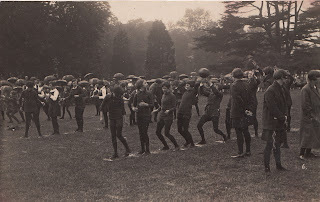 On the topic of young pupils and extra-curricular activities, I have re-posted this exquisite photographic postcard I found a while ago (click here for original post). I have tried to name all the characters, but I am still not sure about a few. 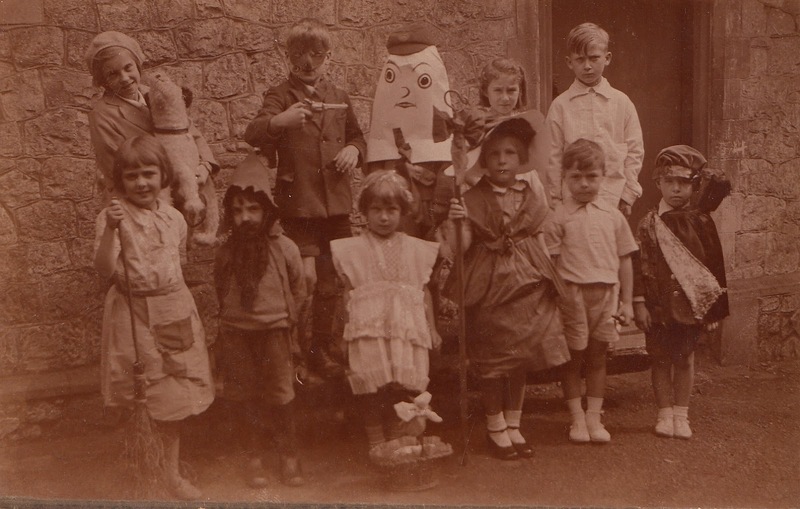 If you recognise any, please let me know! Lastly, here is a recent acquisition from a postcard fair. 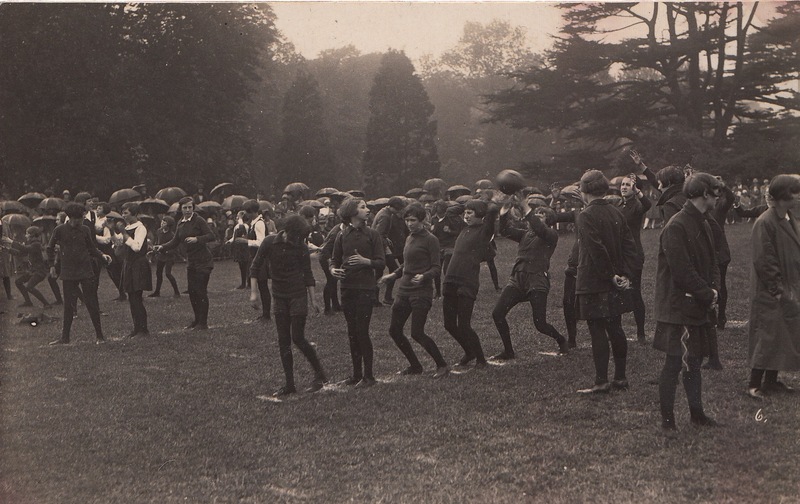 Apologies to those who would prefer not to be reminded of the dreaded medicine ball, but it really is a splendid picture. What I particularly love is the row of umbrellas in the background. It reminds me of shivering on the hockey pitch as the rain dripped down my face! Oh happy days! Thanks to Sepia Saturday for the inspiration! HA -- your tag is great! Had you been returned there, would there have been anyone to greet you? 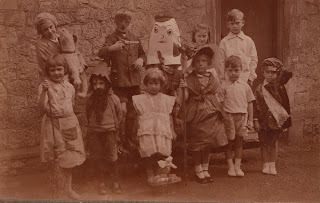 Sorry, not much help on the characters although I definitely recognize Humpty Dumpty and Li'l Bo Peep. Can you give us a link to your original post? As you say it really is a great picture, and as for all the girls with their choppy twenties haircut (it really was quite ugly wasn’t it?) well it’s another wonderful image. That tag must have made a big impression on you to have been saved. I can't believe you kept that tag! That's awesome! When I'm old(er) I want a tag like that attached to my collar! The last photocard is a beaut, but a shame that this sport is not in the Olympics.